What if we all got together and listed the symptoms, consequences, and proper repair procedure of a blown plenum, and then stickied it? That way we would have somewhere to direct everyone to, rather than cluttering the tech page with 5 or 6 plenum threads at a time. It would clean up this forum a lot. I haven't repaired my plenum yet (think it was done by previous owner), so I cant offer any insight on fixing it, but I can give the symptoms and such. 6. If given time to do all of the above, the worst consequence: an empty wallet . The OEM intake manifold is made of 2 pieces. 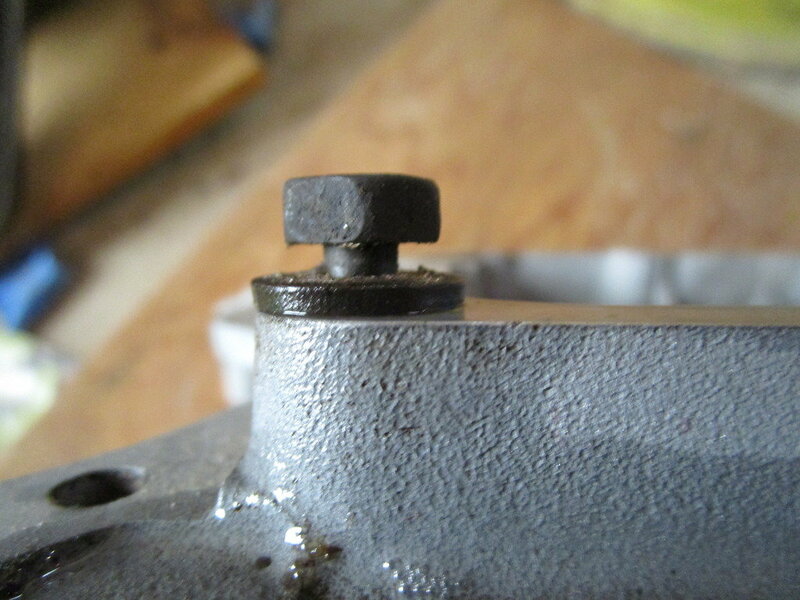 A steel plate is bolted to the bottom, and the stock bolts are simply too long. Photo credit to Snowfan. Thank you very much. Get a good flashlight and, if possible, a dentist mirror. Remove airhat assembly. Open throttle plates and, using the flashlight and mirror, try to get a 360* view of the bottom of the intake manifold. If there is a considerable amount of oil pooling in there, either the plenum is gone, or the pcv is bad. Pcv would spew less oil than plenum. For a more thorough inspection, remove the throttle body and perform the same check; it will be easier to get a good view with the TB off. Note that you will need a NEW tb gasket for re-installation if you go this route (~ $4). As an addendum to checking, and what to look for, This Thread has pics of various plenums, blown, and not. This test is to determine if your plenum has already been replaced (by previous owner). You will need a telescopic magnet (available at most tools/parts suppliers). Remove airhat assembly. Open the throttle plates and probe the bottom of the manifold with the magnet. If it sticks on the bottom, the plenum plate is OEM, if not, it has been replaced with an aluminum plate (which means it has already been fixed). Credit to Saber6 and dhvaughan for suggesting this. Driving with a clogged cat is very bad for your engine, so I have added these ways to check your CAT's performance to this guide. Usually, the first indication of a clogged cat is #8 spark plug fouling (I.E. you pull plug #8 and there is a lot of carbon, but the other plugs look good[ish]) after that, the truck will "chug" under load or when going up hills (feels like a dead miss). Under some circumstances, a clogged CAT will set a p0420 or p0421 code; and the CEL may flash at you to indicate urgency. 1. Take out the pre-cat O2 sensor and take it for a drive (note that the truck will be louder, this is normal). If the truck feels considerably more responsive or has less trouble getting up to and maintaining speed, there is a good possibility that your CAT is clogged. Note that driving without the O2 sensor will cause the CEL to illuminate. Just clear the codes (reset the PCM) afterwords. Credit to HeyYou and Agostage for the information in the above section. Credit and major props to dhvaughan for this link. Seems to be more complete than #2. When repairing the plenum, it is not advised that you re-use the stock intake manifold bolts. They are tty (torqued to yield), and may (probably will) snap upon re-installation, or may cause the intake manifold to not seal correctly due to bolt stretching (which would constitute a large vacuum leak). Hopefully this thread will catch on. If I've left anything out, please post with the info, and I'll edit to add. I'll need someone to post with proper repair procedure (preferably with pics) so that this thread will be complete. Thanks, not that bad, though i have a suspicion you left a few parts out lol. We get a lot of new members that don't look at the stickies. I put a sticky up a while back entitled "Please read this before posting a new topic!" and we get at least three or more members a day, on average, that don't read it, either here or in the general Dodge Ram section. I work in retail, and its the same there... few people actually read signs anymore. However, depending on what everyone here thinks, I'd be willing to sticky it anyway. Maybe it will help at least a little. Ouch! lol look at the fuel rail inlet port hahaha. To make life easier, I highly recommend removing the fan and shroud as the pioneers who have done it before me recommended. That extra 10 minutes of work to pull is worth it imho... actually, i wouldn't do it any other way. Undo the fan from the clutch, and there are four 10mm? bolts that hold the shroud on. Remove the overflow hose from the radiator, and remove the washer fluid hose and electrical connector. It did take me a while to figure out how to get the fan off without the tool. put two bolts in the pulley (existing holes there) and used my breaker bar resting on the frame to give that little bit of tension. Used an adjustable wrench and twisted it loose. Once that is done, pull the whole thing out as an assembly with the bottles attached. Also, it wouldn't hurt to drain some out of the radiator (twist port at bottom). The right way to do it would be to drain the block, but i'll admit I did not do the block. I only got a little coolant into the valley. I vaccumed most of it out, and changed my oil when done. Ran it through for a while with the new oil change, and re changed it again. I saw you removed the fuel rail bolts, and removed the cables from the TB bracket. I did not remove either. I unbolted the bracket from the TB and pushed it too the side. But hey! your welcome to do it any way that works for you. I also did not remove the alternator from the acessory bracket, I just pulled the bracket (with two alternator bolts attached). Also you mentioned that the intake gaskets looked good and hinted at being able to not replace them. Lol, replace them every time. haha yeah i didnt relize untill after the intale was off that you can leave teh intake rail on there. Although I agree that new folks might not necessarily read it on their own, it would offer an easy reply for the rest of us to point to. EDIT: Luckily I had it saved im my Private Messages. One FAQ that we get way too many times in the 2nd gen section is on the plenum plate gasket. The plenum plate is a plate on the bottom of the intake manifold, which we call the "Kegger" (Because it looks like a beer keg cut in half). The bean counters at Dodge made the plenum plate out of stamped steel. And they then mounted it on the aluminum Kegger intake manifold. Due to differences in how steel and aluminum expand and contract, over time, the steel plate will start to rip the gasket between the plate and intake manifold. This allows oil from the lifter galley to seep into the manifold and get sucked into the combustion chamber, causing misfires and pinging, and not to mention the loss of oil. Due to the differences in aluminum and steel, we need to replace the steel plenum plate with an aluminum piece. Two companies make a new plenum plate made out of 1/4'' thicl 6061 aluminum, APS Precision and Hughes Engines. APS Precision supplies their plates with new Mopar hardware, Mopar gasket, and a bottle of Locktite. You can also get the APS kit with new Mopar intake manifold gaskets and bolts. Hughes Engines supplies their plates with new bolts and a gasket that is similar to the Mopar one. The bolts and gaskets for the intake manifold can be bought separetly from Hughes. The choice of APS or Hughes is totally up to you. You can also make your own plate, like I did. The bolts on the intake manifold are TTY (Torque To Yeild) and cannot be re-used. Since I chose instead to make my own plate, I had to find somewhere to get my gaskets and bolts. I was not going to pay $32 for a set of FEL-Pro bolts. Other than use regular Grade 8 bolts, My only option was the dealer. In this case, the dealer was actually cheaper than anywhere else! Part Numbers and prices are listed below. (IT is reccomended that when you do the plenum gasket repair that you do a tune-up (Plugs, wires, dist. cap and rotor), oil change, replace the thermostat and thermostat housing, running a can of Seafoam through the gas tank and through the motor, and replacing the front Oxygen sensor). If you have any questions, comments, concerns, corrections...Please PM me! First, since the factory, Chrysler, bolts are supposedly part of the problem, unless they've changed them, I would not use dealership bolts. Second, the reason your thread was not in the FAQ is because it took you months to finally get your crap up on the forum rather than the weekend or whatever you originally stated you'd get it done in. It took you so long, I finally just started ignoring the thread, IIRC. The factory bolts were too long for the stamped steel plate. The 1/4'' aluminum plate fills that void. The FAQ I posted above was sent to either Laramie1997 or HammerZ71 to be put in the FAQ section MONTHS before I even mentioned doing a DIY.